The Fort Smith Southside Reb — er, Mavericks are far better than their 58-17 loss last Friday to the North Little Rock Charging Wildcats indicates; nor their season-opening loss by a 47-0 count to Springdale Har-Ber. The same is true of the Bryant Hornets regarding their 43-10 loss to the Fayetteville Bulldogs earlier this season. For one thing, North Little Rock, Har-Ber and Fayetteville are three of the best teams in the State. 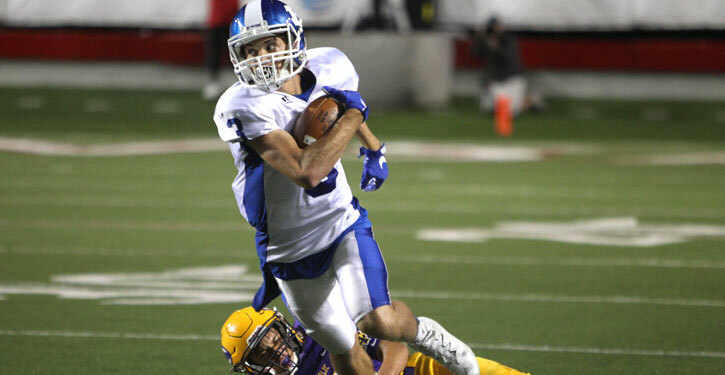 No one would be surprised to see them in the Class 7A championship game in early December. For another, almost all the breaks in those games went against the Mavericks and the Hornets, especially early, and it all began to snowball. All of which makes tonight’s 7A-Central battle between Bryant and Southside so interesting. Neither team knows quite how good they are or can be but, by playing each other, they’ll get a whole lot better idea. The Mavericks may be 2-4 overall but they’ve played a rugged schedule. Besides Har-Ber and North Little Rock, they’ve lost to the top-ranked Class 6A team Greenwood (Bryant fans know about the Bulldogs from playing them last year). They beat Conway by 3 and lost to Cabot, which was unbeaten at the time, by 4. The Hornets, now 4-2, have gathered momentum and, more importantly for an inexperienced team, confidence from consecutive wins over Little Rock Catholic and Little Rock Central. The other Bryant loss to was 29-0 to Fort Smith Northside that, oddly enough, created a re-dedication from the Hornets and an obvious resurgence, which will face its toughest test tonight. Though it’s not all on these Hornets, no Bryant team has ever beaten a team from Fort Smith. They’ve lost all six meetings against Northside dating back to 1999. 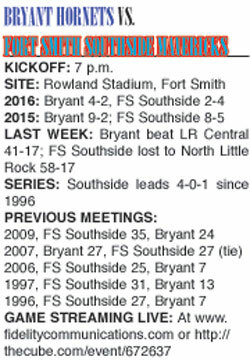 And Bryant teams are 0-4-1 against Southside including their last meeting in the 2009 playoffs. Both teams are balanced offensively. Unofficially, the Hornets have rushed for 929 yards and passed for 799 while the Mavericks have rushed for 740 and passed for 838. Graves Schmdley is the Southside quarterback and has connected on 61 of 119 passes (51 percent) with eight interceptions. Hauken Smith (19 receptions for 322 yards) and Dylan Wyatt (15 catches for 242 yards) are the top targets for Schmidley. Bryant has used a combination of three quarterbacks. Between them Ren Hefley and Beaux Bonvillain have completed 77 of 171 passes for 778 yards with six interceptions. Reece Coates runs the wildcat for the Hornets and has rushed for 11 yards on 16 carries. Coates is the team’s top target with 21 receptions but Luke Curtis, Landon Smith, Seth Tucker and DeAmonte Terry are each in double figures in receptions. The Mavericks have two backs that have rushed for over 200 yards. Taye Gatewood has picked up 286 yards on 80 tries and Kobe Rogers has 252 yards on 48 totes. Jeremiah Long leads the Hornets with 254 yards on 44 carries. Cameron Coleman, who missed the first two games of the season, has 199 yards on 37 attempts. The Mavericks feature huge offensive and defensive lines. Defensively, they’ve held opponents to 1449 yards rushing and 1051 passing and they’ve given up 230 points. But they may have similar distorting factors as the Hornets’ defense has. Bryant has allowed opponents just 645 yards rushing and 871 yards passing and 144 points. It has proven difficult to maintain long drives against Bryant. Of the 20 scoring drives (including three for field goals) by opponents, only nine of them have gone more that 60 yards, seven over 70. Only twice has a team been able to drive 80. And almost every extended drive included a big play. Just one of the 20 did not include a play of 30 yards or more. To that end, Hornets head coach Buck James indicated that his team needs to not only avoid giving up big plays but possess the ball on offense to produce a field-position advantage.